Does anyone teach a government/civics class before high school? I had not thought of doing this, but yesterday in a homeschool bookstore I ran across a copy of Uncle Sam and You and looked through it. I have to say, I was very impressed. Anyway, Notgrass has a 4 year history cycle for grades 5-8. First two years are US history, third year is government, fourth year is world history. This is a Protestant series, but so far- using America the Beautiful- I have not come across anything that is anti-Catholic. ETA: I found these reviews that are encouraging and comment that this program is very in line with Charlotte Mason style teaching. I'm giving Notgrass a try next school year. Doing America the Beautiful with my will be 11 yo ds. The Uncle Sam program looks awesome and I plan to do that the following year, if all goes well and I get a good review from a family who is using it next year. Are you planning to start with Volume 1? We started with vol 2, so I have not looked at volume 1 much. I have not found anything anti-Catholic in vol. 2... hopefully Vol 1 will also be good that way. I'm still considering Vol. 1 myself, Melinda, given your enthusiasm. The reviews I read of it say the biggest criticism is the short time spent on both the revolutionary and civil wars, but I figure that there are plenty of good books about those two wars to choose from to flesh it out. I am also thinking that The Catholic Faith comes to America from Seton will be sufficient to add a Catholic flavor. I'm starting at the beginning. I think adding in Catholic stuff will be easy as I have resources on hand for that. Maybe instead of reading about a protestant missionary that headed out west we will read about a Catholic saint instead. Lindsay, I just went ahead a purchased it this week. I knew I couldn't come to a decision without seeing it. Arriving tomorrow. Cathy Duffy says the series is a mile wide and an inch deep, and I agree! In Vol 2, WWI and WWII are also covered in a few pages. We fleshed those out with living books- historical fiction, books on tape and picture books, and that worked very nicely. I had to do the same with the Revolution and the Civil War when we used STSS. There is just so much information there... I didn't feel like either STSS or AB went into all the rich details possible . I don't know that any book can- you get bogged down with all the battles and the sheer volume of information. The trade-off with AB is that we get a lot of other interesting details- historical places, geography, biographies, many more pictures than STSS (some in black and white, some in color), You can pick and chose from all the activities at the end each lesson; I really like how a handful of vocabulary words are listed- we discuss those and make sure we all know what each one means. We also use the map book. Overall, I have to says that AB is just way more interesting and conversational. I did not know that Jimmy Carter climbed Mt. Fuji when he was 70. Now I do. We read the chapter about Billy Graham last week, which was very interesting. He has been an advisor for every president from Eisenhower to Obama. That's quite a feat! And today, listening to Ave Maria radio, I heard that later in life he was very supportive of the Catholic Church, even to the point of losing Protestant followers because of that. We do Civics from early elementary on - and usually tie it in with our American History/Geography years - and it has worked out to be during election years. If you search for Elections and Voting on the forums - you will see some great threads from 2008 and 2012 with lots of resources. I think I posted to the 2008 one with a lot of resources. 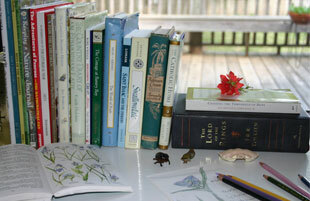 Later I can post lists of picture books and other books used, plus websites etc. We have done unit studies and lapbooks too. Living not far from DC - we usually do trips which are good for civics - in 2008 we visited the Capitol, in 2012 the Supreme Court. In 2004 we visited the White House. Our kids have volunteered with political candidates since 2008 - in 2012 even my 8 year old was in the campaign office making calls. Next school year is our next civics/history/geography year - I will be updating my plans. I would like to visit the state capitol next year - maybe on a day where there is a debate about homeschoolers. Any other suggestions for Civics/American Government? I like Notgrass' America the Beautiful - can anyone give further comment on their Uncle Sam and You series? Is it good as a read-aloud? Are the additional activities necessary? I see that it is a year-long course - did you find that to be the case? My daughter did Uncle Sam and You this year with her co-op for 7th grade. I liked it, she didn't. And my son did the Notgrass American History(high school) 2 years ago with the co-op, including the Literature part. He didn't like Notgrass either. Both thought the Notgrass books were dry. They complained all year. BUT, previously, at home we did do some pretty awesome history with Sonlight and Seton books and projects and field trips and then we moved(BIG move) and I put them in this co-op. I think, if you have time and kids are amenable ages a read aloud could work--you could chat about the photos and a few projects and field trips and it would be easy. I just didn't have any spare energy after the move and family issues. Anne, married to dh 16 years!, ds,(97), Little One (02), and dd (02).